There are people who inspire, who seem to know what they are doing, and in whose presence you start seeing the picture. We call them visionaries. Somehow, I was wondering what differentiates visionary people from others. And, then, I realized that, while talking about this quality of the human beings, we often use it in an almost magical sense. Although, in general, we call “visionaries” those who can see the big picture and connect the dots for others without necessarily going into the smaller details. And, as that vision is applied/implemented, the smaller details get organized better. Here is a problem, though.. Humans’ capacity to understand things is somewhat limited. Yet, as we start getting into the details of something, it becomes more and more complicated to understand and communicate those intricacies to the others. That’s just simple logic – if you want to understand and explain the details, you have to spend much more time than if you only wanted to communicate the big picture. What is the big picture, though? It depends on the perspective. For an electrician bothered with the details of how all those wires are organized in your house, the big picture might include all the electrical equipment located throughout the house. However, for somebody concerned with the efficiency of the power grid, those details would be absolutely irrelevant. Everyone has their own big picture and everyone is concerned with their own level of details. Naturally, then, those who are concerned with the higher level of details might be considered “visionaries” by those who have to look at the underlying level of details. In case of the electrician above, a person who’d be talking about standardizing electrical equipment locations in the houses might be considered a visionary by the electricians in the sense that, as their vision gets applied, the wiring becomes more predictable/better organized for the electricians. At the top of the pyramid chart, there would be people who are least concerned with the details. They are working with the really big picture. The number of people at the top level is not even comparable with the number of people at the bottom of the pyramid where everyone is concerned with the smallest details. 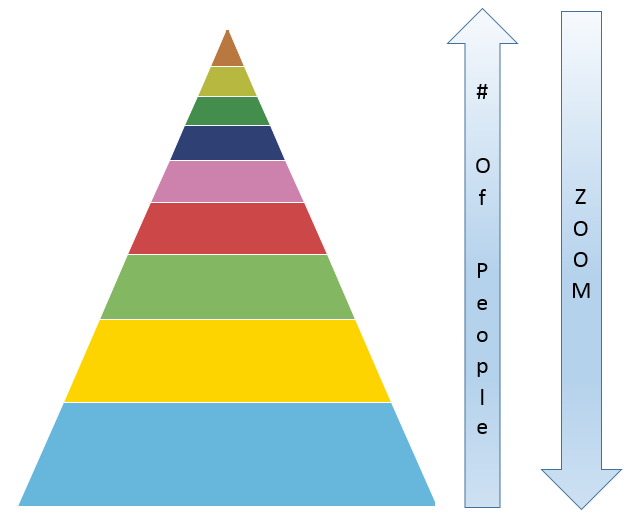 So, the “area” of each level of this pyramid represents the number of people there. And, at the same time, it represents the “zoom” level.. In other words, the area is also representative of the level of details. As you are getting more and more details at the lower levels, you need more and more people to work with those details since it becomes more and more difficult to handle them. On the other hand, as you are getting up the pyramid, you need less people since there are less details. And there is yet another conclusion this chart might communicate. As you keep moving between those levels, it is possible that the level of details becomes so different that people positioned at the different levels can’t understand each other anymore. In the sense that they are normally concerned with the details which are only remotely relevant at that point. In other words, to consider somebody a visionary, one still has to have some appreciation for the details the visionary is talking about, so both persons may have to be not that far apart on the pyramid chart. PS. I’m not implying this is a 100% accurate interpretation.. or an accurate interpretation at all.. but it does put those things in perspective for me and makes them a little less magical, at least.